Zorbas gulet is a 2017 build, Bodrum charter. This darling gulet has a classic appeal of a Turkish gulet, yet provides modern facilities in a refreshing color scheme well suited for the Aegean region. 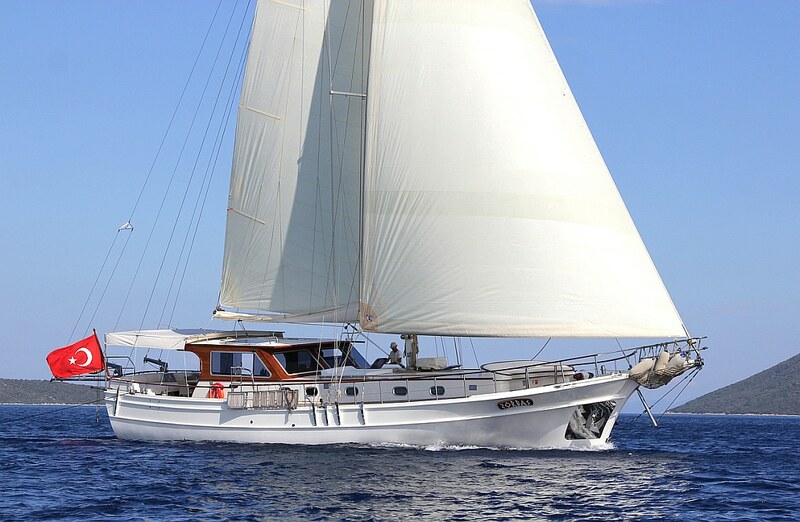 The gulet Zorbas accommodates up to 4 special guests in 1 master (with TV), and 1 double cabin with air conditioning. Each cabin comes equipped with hairdryer, enclosed shower, vanity and wc. The aft deck can easily serve 4 guests (whether couples or single family) with large cushions bordering the stern and varnished quality wooden table and chairs. The spacious forward has sunning mats for each guest with beach towels, and crescent shaped seating area and tables. The Zorbas is a Bodrum quality gulet, ideal for couples only or single families, in total luxury and comfort, served by a professional crew of 2 with that warm Turkish hospitality! Equipment: TV in Master cabin & salon, DVD player, Music system, Wifi Internet, Ice maker, Coffee machine, Deep freezer, 3.50 Jokerboat & 6 Hp Suzuki outboard, Basic fishing tackles and Snorkelling equipment, Paddleboard, Backgammon & Playing cards.